Yes, you read that right, Want to BURN a snowman. I'm sure there many parents who would happily consign Olaf to the flames; however, I have no idea how you actually incinerate snow but apparently it's possible in Michigan - and before you go, "oh, those stupid Americans", it seems that it was inspired by the Germans - not exactly known for their frivolity, and that the Swiss do something similar as well. At Lake Superior State University today they will, for the 49th time, burn a snowman, the Swiss are a little tardy and in Zurich theirs will be burnt in April. It is a time honoured tradition that aims to welcome spring by banishing 'Old Man Winter' accompanied by free food and drink, and poetry plus a huge bonfire complete with snowman. Click through to read some of the history and see videos of two previous burnings. And spoiler - the American snowman is actually made of wood and paper destined for recycling. 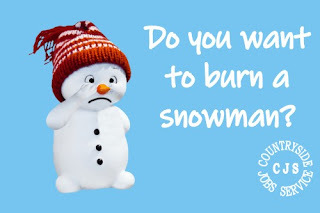 So I still don't know how to burn snow… And Olaf survives for another year - sorry! But the upside is that winter is officially banished.